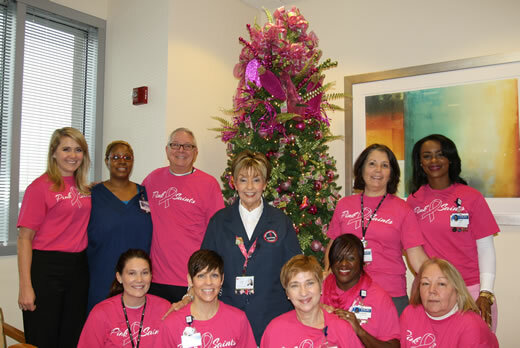 Saint Joseph's Auxiliary volunteer Judy Eurton (center) and the Ed and Dora Voyles Breast Health Center staff think PINK for the holidays. For the past eight months, Saint Joseph’s Auxiliary Volunteer Judy Eurton has brought her joyous spirit to the staff and patients at Emory Saint Joseph’s Ed and Dora Voyles Breast Health Center. Whether she is escorting arriving patients to rooms to prepare for a mammography, or providing a comforting word or gesture to those in need, Eurton finds her volunteer service is a small way to honor the memory of three close friends who lost their battle with breast cancer. Since April, Eurton has dedicated more than 270 hours of service to the Breast Health Center. "This is a great opportunity to give a lot of hugs and meet great people," she says. Not only has Eurton been giving hugs to many patients every Monday and Thursday, but shortly after beginning her volunteer service, she began shopping for Christmas decorations, with the intention of transforming the Center into a holiday wonderland. Patients and guests arriving this month in the main reception area are greeted by a nine-foot tall tree that includes an intricate topper designed by Eurton, handmade bows, hundreds of glittering ornaments and carefully wrapped pink packages underneath. Adjacent to the registration desk, Eurton’s artfully designed wreath hangs above a collection of miniature ice trees, snowmen and a menorah. Eurton and Breast Health Center staff member Joy Nather worked after regular office hours to create this magical setting, which also included decorating a six-foot tall tree in a patient waiting room located in the rear of the facility. Adding to the festive aura are more than 100 lights per foot on each tree. Eurton began the intricate design process by working from the top to the bottom of each tree, while contrasting the pink and green ornaments with her handmade bows. "I just want to make everyone smile and put them at ease," she says, about the holiday decorations.